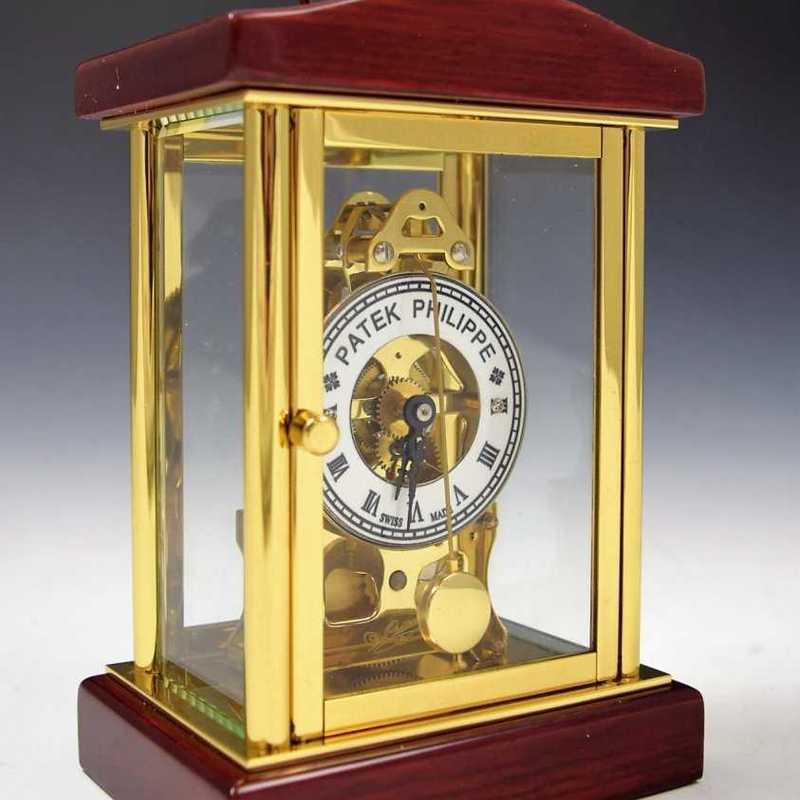 Thank you for sending your question to mearto about the "Patek Philippe Dealers Showroom Gold Desk Clock--*Last One*". I can only provide you with an educated opinion about the authenticity of this clock. Essentially this is a very small, 8" x 5" desk timepiece in the form of the old style crystal regulators, made most famously by the Ansonia Clock Company of New York City at the turn of the 20th century. Ansonia copied the french late 19th century crystal regulators. . . This clock is constructed of gilt metal posts with glass panels on all four sides. There is a wood colored arched pediment above the case and it sits on a reddish wood colored broad base, sitting flat to the surface without feet. . . The white dial inside the casing has Roman hours, closed minute ring, machine stamped skeletonized 18th century French style hands and the dial is signed, "Patek Philippe, Swiss Made". Take note of the two exposed Philipp's head screws that connect the dial to the movement behind it. That is NEVER something that would be seen on a good and genuine watch or clock. The movement is not constructed like those seen in crystal regulators but rather similar to those found in skeleton clocks, i.e. the two shaped and fenestrated gilt metal plates which support the gearing are connected with grey metal tubular pillars. There is an anchor escapement, steel cut pinions, brass gearing and a single barrel spring for powering this time only clock. Of most interest is the name that I can barely make out behind the pendulum bob on the front of the movement plate. Perhaps it is the name of the "dealer" who made or had the clock in his shop. It is most likely a fake name. Actually, this is a pretty, but cheaply made clock that is not a replica, but rather a fake or forgery which Patek Philippe had nothing to do with. One look at the title on E-Bay would make me look no further. The clock is not gold and it is not the last of any type of model, and since it brought over $700 it will reappear at some point again. . .
My best guess about the origin of this clock is that the movement may have been made in Germany or Switzerland, but I suspect that it is more likely a product of clockmakers in Asia. Suddenly a whole series of similar Patek Philippe titled clocks appear on E-Bay. they should be rare if genuine, and hard to find, but they now appear to e ubiquitous and wherever you look. That tells the whole story, in the same way that fake Rolex watches were sold on the corners of downtown New York City a half century ago. Except this deceit is much easier since you just have to turn your device on to find it. . . It sold in 2014 for bout $1000. Here is the description - "RETAILER DISPLAY MANTEL CLOCK "PATEK PHILIPPE", Anonymous Swiss, signed for Patek Philippe, Genève, "Master Watchmakers Since 1839". Made for display purposes in the 1980s. Unusual, gilt-brass, 8-day going, hour and half-hour striking store-display mantel clock." Antiquorum Auction in Switzerland then makes the following comment - "An interesting retailer's clock for display purposes. Whilst this is an attractive piece it must not, of course, be confused with the fine clocks made by the Patek Philippe Company, the present clock is not made by Patek Philippe." So, this was an example which one of the finest auction houses in the world acknowledges does not meet the standards of Patek Phillipe, rather than encouraging that the buyer purchase it. . . The problem goes back to the quartz revolution in Switzerland. Apparently, Patek was being squeezed by quartz watches and they began to make cheap quartz run clocks for store displays. Later they had a famous German firm, Kienzle make mechanical movements and quartz movements for showroom clocks clocks that bore the Patek name on the dial along with the retailer's name. They quickly stopped doing this in the 1990s when mechanical movements came back into popular style. . . So, I think this clock, is simply one piece in a larger scam on the public. But who is responsible for these clocks, I could not tell you, but they were created cheaply to deceive the public and that gives them little or no value in my eyes. I am going to call this a fake, simply because I have little doubt that it is. I am sorry if you were the buyer or just one of the bidders on this clock. It does have a pleasant appearance, but buyers should be knowledgeable about what they are buying or they should ask prior to buying. At any rate, than you for asking, and I send you only my best regards. Thanks. I didn’t buy it. I just wanted to confirm my opinion. Wise decision. Than you for asking.